After months of planning, Growth Energy’s annual advocacy conference, now officially called the Biofuels Summit, is here! The GE team is hard at work today with last-minute prep before members arrive. This week, over 150 leaders of the ethanol industry will arrive in DC from across the country in order to champion the association’s policy priorities on Capitol Hill. 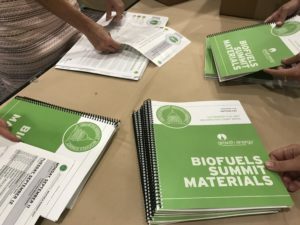 During Growth Energy’s Biofuels Summit, advocates will meet with members of Congress to urge support for protecting the Renewable Fuel Standard (RFS) and for securing a legislative fix for the Reid Vapor Pressure (RVP) restriction that places barriers on consumer fuel choice during the summer. “Now, more than ever, this industry is poised to drive the next great wave of economic development across the American heartland,” Growth Energy CEO Emily Skor said. Share your photos with us on Twitter using the hashtag #BiofuelsSummit — we can’t wait to see you!